I was born in the town of Lukoml, Chashniki region, in an interethnic family. 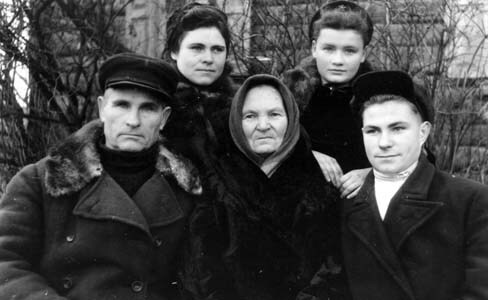 My father, Joseph Elievich Kagan, was Jewish and mother, Maria Vasilievna Zuyeva – Russian. I was born in 1931 and when the war began I was already nine and a half. There were two children in the family – my elder brother and I. 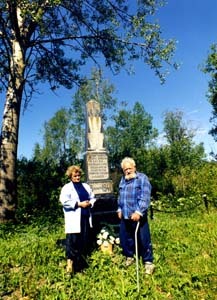 My father worked as a house painter in Chashniki together with his cousin, who was also executed by fascists in Lukoml. Before the war we were planning to move to Chashniki and bought a house in the center of the town. It was a big Jewish house, divided into two parts – my father’s and his brother’s house. His brother’s family managed to move there, we did not. 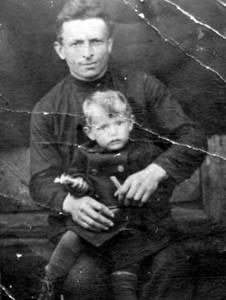 Iosif Kagan with his son. - What did Lukoml look like? - The center was occupied with Jewish houses, which stood really close to each other. Yefim Isaakovich Rutman remembered that when he was small the boys would walk across the town center by jumping from one roof to another. Our house was in Chereiskaya Street. There were no other Jewish houses behind ours. Next to our house there was an obstetrical ward, where the obstetrician’s family lived. Lukoml was a rather big town with three collective farms on its territory. We lived in the central part, which had numerous shops and a school. There were a lot of Jews living here, many of the young people moved to study in Minsk. I remember one family really well – it was the family of Lapus Hanon, a rabbi who had eight children. He was arrested in 1937 and shot by the Soviet authorities as “a public enemy”. All the children, except for one, were later shot by fascists. - How did you find out about the war? We did have a premonition that the war was going to start. My father was worried and that was the reason why we did not move to Chashniki. He wanted us to stay with the people that were familiar to us. - When did the German army invade Lukoml? - I do not remember the exact date, but it was somewhere at the beginning of July. It was very warm. The occupation of Lukoml was preceded by battles. Ivan Fedorovich Ruzhinsky, the head of the obstetrician ward, gathered nurses and other doctors and went to pick up the wounded soldiers. I was sitting on a hill with a group of boys when we heard crackling sounds of approaching motorcycles. Those were Germans – they did not look tense at all, in fact they felt themselves very free. Some of them were playing harmonicas, they were all armed. So they drove by. Everyone went numb. About three hours later we heard shooting on the other side of the river. We had no clue what was happening. It turned out that a traitor named Raduk (he was later killed by partisans) told the Germans where the wounded soldiers were. The Germans then took the wounded out of the hospital in their underwear, gave them spades to dig the grave and then shot them. It happened on the first day. - When was the ghetto in Lukoml established? - There was no ghetto – everyone was allowed to stay in their houses but made to wear yellow Magen Davids. - Were all the Jews made to do this? - Was your father wearing one, too? 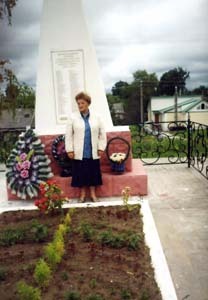 Opening of memorial in Lukoml. 1954. - And what happened then? - The Germans left a garrison in Lukoml and started recruiting the police. There were local villains who opted to join the Nazi police. Two of them once went to a village called Gili to recruit other policemen and were murdered. by the memorial to the executed partisans. - What happened to the Jewish population? - The Jews of Lukoml were shot on October 18th, 1941. - Do you recollect that day? - I do. My father had a premonition or maybe he knew something – he talked to a lot of men. They were said they would be taken to the ghetto in Chashniki. So father told my mom: “Take the kids now and go towards the cemetery. There you will cross the river and stay with Aksinia Siyanovich.” So we went - he literally forced us out. When we came to this woman’s place, she was talking to my mom about something, they were crying and then suddenly we heard shootings. - How many people were executed? 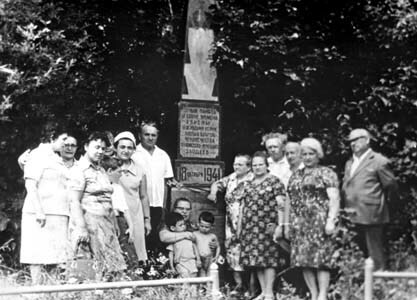 - According to the lists, made by Yefim Isaakovich Rutman, there were 62 families. - What about the children from mixed families? - The first mixed family in Lukoml was, in fact, ours. My mom’s parents were already dead when the war started but she had brothers. One of them died at the battlefront. The other two brothers refused to shelter us after the Jews had been shot. After the war they never saw or invited me when I came to Lukoml. - When my father was shot, mom took us to a village called Kruglitsa to her brother’s family (the one who was killed at the front). He had a wife and two children. We stayed with them for a while. Then we heard that the Germans had left Lukoml and so we came back to our house. We tried not to go out a lot. The Germans and the police had been ousted but German punitive squads came to town every once in a while. On January 14th, 1943, a punitive squad with Pavel Sergeyevich Chugunov, the head of Lukoml police, broke into our house. My brother was not at home, I was alone with my mom. Chugunov was shouting something about the partisans, claiming my mother had connections with them. He chucked me out of the house. Then I heard shooting in the house. I was found by my neighbors and spent two days in their house. Then their daughter took me to another village. Mother was lying in the corridor for two days… She was literally torn into pieces. - What happened to your brother? - He joined the partisans. - Who sheltered you afterwards? 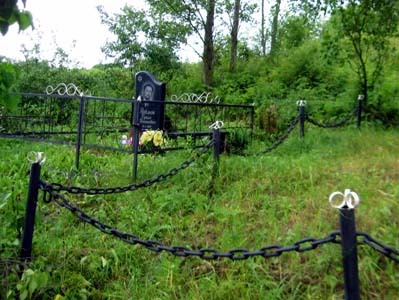 - Mother was buried in the village where her brother lived. I only remember sitting on the snow in the cemetery and feeling really cold. Then we came home to my uncle’s family. The punitive squad had already left. I remember a woman came and said to my aunt: “You have so many kids of your own and now you have to support these Jews.” Mother’s brother got up and left. He came back, took me by the hand and we walked to our pre-war neighbor – Ivan Fedorovich Ruzhinsky. At that time he had ten children in his family, I was the eleventh. - How did you meet Yefim Rutman? I did not join them and the Ruzhinskys said: “Let her finish school and continue her education. So I entered a medical college in Minsk. By that time Rutman had come back to Lukoml. - When did he set up the memorial to the executed Jews? - In 1954. He did everything by himself. - Where was he working? - First at a school - he was a teacher of German. Later he was sent to a collective farm and became its head. Then he was appointed director of a dairy factory in Novolukoml. He lived in a house next to the one that used to belong to us. After the war he renovated our house and moved there with the family. - The house has a word “Jews” written on it. - Another Jewish man returned from the battlefront – Hanon Lapus. He also wished to be buried by the memorial. Both of them were buried here. P.S. The list of the victims was made by Haim Rutman. It includes only the people who lived in his neighborhood before the war and the people he knew personally. We hope the website visitors will be able to add the missing names to Lukoml martyrology. Video interview with Valentina Filipkova.